Steve has served as senior pastor of Staunton Grace since August of 1996. He came to know Christ in 1974 as a college student, and has served in numerous Christian activities and outreaches. In 1979 he became the founding pastor of the Raccoon Ford Christian Fellowship in Culpeper County, Virginia. He received a Bachelor of Arts degree from the University of Virginia in Charlottesville, a Master of Divinity degree from Regent University and a Doctor of Ministry degree from Gordon-Conwell Theological Seminary. Steve and his family lived in Slovenia and Croatia from 1992 through 1996 where he served as academic dean and as resident faculty at the Evangelical Theological Seminary in Osijek, Croatia. He has ministered in churches in Croatia, Slovenia, Bosnia, Romania, Macedonia and Ukraine where many former students now serve in leadership roles. 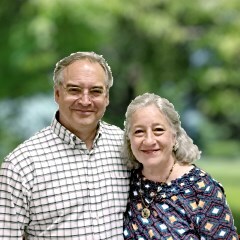 Staunton Grace releases Steve to continue this connection with post-communist Europe through short-term teaching missions twice a year. He currently serves as adjunct faculty at the Evangelical Theological Seminary in Osijek and the Ukrainian Evangelical Theological Seminary in Kiev, Ukraine, teaching courses on Wisdom Literature from a Pastoral Perspective, Patrology, and A Survey of the Second Temple Period. He also conducts small group seminars for practicing pastors from the former Yugoslavia through the Institute for Pastoral Studies in affiliation with the Evangelical Theological Seminary in Osijek. Steve and Jane (Carver) Paulus have been married since 1979. They have three children, two daughters-in-law, one grandson and four grandaughters.